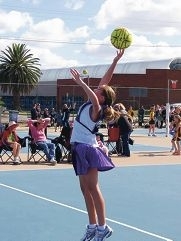 Ellenbrook number 19 team member Callie Cox shoots at goal. ENA has teams ranging from Year 3, playing in the NetSetGo competition, right through to senior women. It also encourages players from Year 7 upwards to participate in the umpiring program. This week, we take a look at the Grade 6 girls in Ellenbrook number 19 team ” Madison, Mikayla, Callie, Teale, Jade, Holly, Isabelle, Lily, Jasmin and Taylor. After a convincing win in their first game against Illusions 8, the girls were excited to take on Swan Christian 6. It was an evenly matched, hard-fought game from the start, with the final result being an exciting draw. It was a good outcome for the Ellenbrook girls, who had to claw their way back in the final quarter. With a strong defence, great goal shooters and a midfield full of ‘pocket rockets’, Ellenbrook number 19 has the mix to be a strong performer all season. With finals being introduced at the Year 6 level this year, the girls will be aiming high and working on their skills during training sessions.